Perhaps you’ve heard it before, or might even believe it’s true yourself, that riding in the back seat is safer than riding in the front, and that wearing a seat belt is unnecessary. Safety experts have proved with repeated research that this simply isn’t the case. A recent survey reveals how many people continue to believe that seat belts aren’t necessary when riding in the rear seat, despite all evidence to the contrary. The Insurance Institute for Highway Safety (IIHS) conducted a survey of nearly 1,200 adults located across the country, asking about their seat belt use. Ninety percent reported that they wore a seat belt every time they were seated in the front seat, but only 72% said that they always wore a seat belt when sitting in the back. Even more troublingly, only 57% of survey participants said that they wore a seat belt every time they rode in the back seat of an Uber, taxi, or other car service. Among those who admitted to not buckling up every time they were in the back seat, a quarter explained that riding in the back seat was safer, and a seat belt wasn’t necessary. Research conducted by the IIHS alongside the Children’s Hospital of Philadelphia has found that, when compared with restrained back-seat passengers, unrestrained back-seat passengers are eight times more likely to suffer a serious injury when involved in a car accident. Not only can these un-belted passengers be injured themselves; they can also hurt other vehicle occupants. When in a crash, an unrestrained person will become a heavy and dangerous projectile moving through the car. 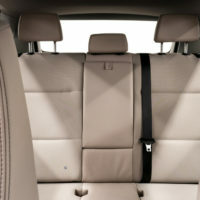 Often, unrestrained rear passengers will slam into the back of a front seat, forcing the occupant of that seat into the steering wheel or windshield. A study by the University of Virginia revealed that a driver who is carrying an unrestrained rear-seat passenger is two times more likely to suffer fatal injuries in a crash than if the passenger had been restrained. Another 13% of survey respondents who admitted that they didn’t wear a belt in the back said that they forgot to wear one. Nearly all cars now have a notification system for when a front-seat passenger isn’t wearing a seatbelt, but despite available technology, few have such a reminder for rear-seat passengers. Safety organizations are calling on car manufacturers to make seat belt reminders for rear-seat passengers a standard feature on all vehicles.